Travel inside Langjökull Glacier and explore the glowing man-made ice tunnel. 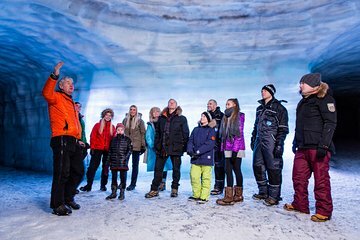 On this 2-3 hour tour you'll be driven over the ice cap in a specially modified glacier vehicle before entering the glacier on foot in a deep man-made tunnel that's been carved through the creeping ice at 4,000 feet (1200 meters) above sea level. Walk through the frozen caverns and tunnels lit by glowing lights and hear from your guide about how the tunnel was made, as well as learning about the geology and history of Iceland. Marvel at the man-made ice chapel and look into deep crevasses in the ice. This is truly a once-in-a-lifetime experience. Amazing trip. Guides are really good. Long trip up to the glacier but well worth it as you get to see some incredible sights. Warm gear can be provided. This tour was amazing. My 5 year old daughter thought it was the best day ever! Our tour guide, Thor, was very knowledgeable and had a great sense of humor. He even sang in the ice chapel to demonstrate the beautiful acoustics. Definitely worth the money. Really great tour, guides were very knowledgeable. Once in a lifetime experience! Dress warm and wear good shoes! Great tour! Very kid friendly! How often do you get to walk inside a glacier?! This was one of the highlights of our trip. Where else can you explore caves and tunnels underneath a glacier?? The guide was fantastic and the experience was unforgettable. One thing to think about for this excursion is transportation from your hotel to the meeting point where they take you in an 8 wheeled vehicle up the glacier. We rented a car in Rejkyavik and drove ourselves 2 hours and appreciated the scenic drive, but clearly, one needs to plan this in advance. Excellent tour! I went on this tour in January and it was incredible. Very well organized and the guides were very knowledgeable. It was also the right duration for what we were seeing. This was the activity my husband and I wanted to experience most while in Iceland. The initial one was cancelled due to weather. Fortunately, it was scheduled for the first day we were there so we were able to reschedule but we spent a lot of extra money and had to scramble to make it happen. I just wanted to mention this because tours in Iceland can frequently change or cancel because of weather so try to plan accordingly. The tour guides were a lot of fun and really seemed to enjoy their jobs! They provided a lot of interesting information and were knowledgeable about their tour and land. It was more than wonderful to be where you're taken on this tour. Being on top of a glacier, on the snowy mountains was just perfect. I am not a very descriptive writer, but if you're interested in being on top of a mountain, on top of a glacier, walking through a glacier and riding safely in a giant snow vehicle with great guides, this will be the perfect tour for you! Just try to prepare for the weather accordingly! Tour was as expected. The guide made sure all people were properly attired for the cold before they let you go on the tour. The guide is very informative. the ice cave will only be around for another 7 years, pending the climate changes.